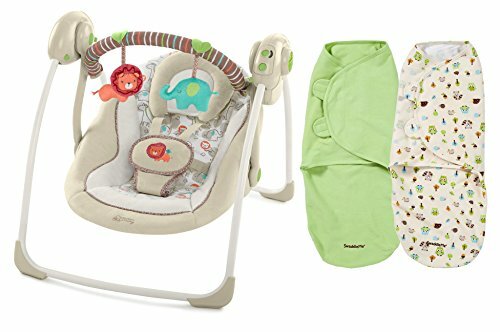 Comfort & Harmony Portable Swing will surround your baby in a plush kingdom of luxurious fabrics and adorable jungle characters. The Portable Swing is designed to fold in a snap to make travel or storage easier. TrueSpeed Technology maintains 6 consistent speeds-even as baby gets older. WhisperQuiet technology ensures that baby won't be disturbed by noise while swinging and listening to 6 melodies. You can easily control the volume level as well as the amount of time baby swings thanks to the handy swing timer with auto-shut off. The ComfortRecline seat offers two positions and surrounds baby in soft fabrics and a headrest that can be removed as baby grows. Battery Requirements: 4 C cell (Not Included). Wrap baby securely for a safer, better sleep. Extra soft, adjustable wings provide a perfect snug fit even for wiggly babies. Secure design creates a cozy, womb-like feeling for baby and prevents the startle reflex that can wake up your infant. Designed with leading safe-sleep experts, SwaddleMe is trusted by parents around the globe. If you have any questions about this product by Comfort & Harmony, contact us by completing and submitting the form below. If you are looking for a specif part number, please include it with your message. Fisher-Price Rainforest Friends Take-Along Swing And Seat.